When the big boys were little, my biggest writing project of the year was my holiday letter. Every December, beginning in 1994 just before Claude’s first birthday, I wrote a two-page letter of family updates and book recommendations mixed with what I hoped was enough humor to make the reading interesting. I made 60 or so copies of the letter and placed it, along with a family snapshot, in a holiday card where I wrote personal notes to the recipients. This last step took many hours and, as a result, my cards were never mailed prior to New Year’s Day that first year or any year thereafter. This never bothered me as I figured after the rush of holiday cards in December, who minded getting one in January when all else in the mailbox was bills? For many weeks each January, I carried a small shopping bag of printed letters, photographs and card boxes with me wherever I went. Once the boys were old enough to join the school ski club, I would help them into their skis, send them off to lessons and then hole up in the “lodge” (which more resembles an elementary school cafeteria than any Alpine lodge such as the one in Charade with Audrey Hepburn and Cary Grant) where I would write personal notes for two hours or more. Beyond keeping in touch with friends and family, each year I added the latest letter and photo to a manila folder with the previous years’ installments, creating a collection for my children to have when they were grown. The whereabouts of that folder, which was close as I ever got (or will get) to scrapbooking, I no longer know. This year, as with the last three, our family continues on with the long and acrimonious divorce that any witness could have predicted the day a Franklin County judge declared us husband and wife. We began the day arguing, quarreled our way through a breakfast at Bob Evans and sulked as we dressed for the event. So, too, anyone who believes in omens could have foretold the outcome of this union when, as we bickered our way to the courthouse in an ’83 Toyota Tercel, the car slowed and then stopped in the middle of the busiest section of one of the busiest roads in Columbus, having run out of gas. Were we mindful or superstitious, we would have wisely called the whole thing off then and there. Now, a few years later, resuming the tradition of holiday letters is difficult. It has become as passé as so many other things. Where I used to try and find attractive ways to display the dozens of cards that would fill our mailbox in December, we now receive a handful of single-paged, no-fold cards made online, usually sent by people with small children, with three or four digital photos of the sender’s family. I like these because I feel less guilty recycling photos printed on cardstock paper. Back in the day, I never knew what to do with all the snapshots of other people’s children. I’d stick them in a seldom-used drawer and then, often when moving and with much guilt, throw away a bunches at a time. Last year, I took part in this latest online card creation trend and ordered a two-sided piece that doubled as both holiday card and birth announcement for Lyra. Of the thirty I ordered, I managed to mail about ten. In 2013, I wrote essays about our family all year long and posted them publicly on Whoopsiepiggle.com, where anyone can read them, leaving me to think that holiday cards would be overkill and, besides, my time is a more rarified commodity than ever before. During the ten years I lived with my mother, we spent Christmases in LaPorte, Indiana, where her own mother had been raised. Arriving at my great-grandmother’s house late in the afternoon of Christmas Eve, I’d run to the chair by her Christmas tree and pretend to watch television while slyly assessing if any of the presents under the tree were for me. From there we’d caravan with other family members to one of my grandmother’s siblings’ or cousins’ homes for a buffet dinner that always included Swedish meatballs. Though not unpleasant, these dinners were dull affairs for I was adrift between generations. As the first great-grandchild, born to a teen mom, I was closer in age to my mother’s youngest cousin (five years my senior) than to the next great-grandchild (eleven years my junior). While the big kids gossiped, I watched television until we returned to my great-grandmother’s house where I slept on the living room floor as children will: like a rock dropped into deep waters, oblivious of the mantle clock as it chimed every fifteen minutes, waking all visiting adults in the house. On Christmas morning, the presents were divvied up and then everyone plowed through their pile all at the same time. We’d clean up the torn wrapping paper, eat breakfast, get dressed and pack our belongings. When Shirley Temple’s movie Heidi came on WGN just as it did every Christmas Day, I knew we’d soon leave, as we never stayed longer than the scene where the monkey throws candlesticks from on high. By day’s end, we’d be back home. Well before New Year’s Day, the artificial tree, which was the only nod to Christmas in our house, was dismantled and stored away for another 50 weeks. All in all, Christmas was a tidy, efficient affair. I love Christmas. The entire United States is quiet and none of us are expected anywhere else but home. I love Christmas because it is the one day where the only plan is to be together as a family, eating and playing, relaxing and talking. A day that invites ritual, Christmas easily adapts to refashioning. Maybe one day, when the babies are big, we will spend Christmas on holiday trips to warmer climes. But for now, we stay home, a decision I have mostly abided by since my first child’s first Christmas (there have been three exceptions, including the year we visited my grandma before she died). We open one present at a time, “Whose turn is it?” Jules or Hugo will ask before pulling a package from under the tree. The process takes hours, in part because we stop to eat coffee cake and pie, drink coffee and mill about. Unlike most days, there is no need to rush on Christmas. This year, we didn’t get to our stockings (filled mostly with edibles) until after dinner. I love bringing in a fresh tree and filling it with lights during the darkest days of the year and having the children trim it with their ornaments. My ex-husband’s mother, who died before we met, had given her children an ornament each Christmas. In his mother’s handwriting, my ex’s name and a year were written in permanent marker on the back of the few ornaments he brought to our first Christmas tree. I was charmed by this tradition and have done the same each year since Christmas 1994. The big boys have boxes with substantial collections of ornaments, some of which were inexpensive, like this year’s gnomes (two for $5), while for others I paid a premium (last year’s four gingerbread boys and one gingerbread girl made of silver and engraved with the children’s names, ages and the year). Many years ago, I commissioned the Waldorf school’s handwork teacher to make three wool felted stars with different holiday scenes. She embroidered the boys’ names and the year on the backs. Like many artists, her artwork went through project periods. I met her soon after she began making her felted stars. Fabulously creative and painstakingly detailed, they were also expensive and I put money aside for several months in order to buy all three in time for Christmas. The first years the boys went to the Waldorf school, the handwork teacher was in her classroom every morning at 8:30, even though she didn’t teach until after 10:30. She arrived early because her own kids were students in the school. On a beautiful autumn morning when Claude was in the second grade and Hugo in preschool, I sat with baby Jules and watched as the handwork teacher showed me all the stars she had made over the summer break. While we were visiting, I took a call on my recently acquired first cell phone. “A small plane has flown into one of the World Trade Center towers!” I said, immediately repeating the words of the neighbor who had called. Even now, whenever the events of 9/11 are mentioned, I see a classroom cluttered with skeins of yarn and sheets of felted wool, gently bursting with patient creativity and the disconcerted look on the teacher’s face as neither of us were able to process what was happening. A few years ago, after her children had graduated from the Waldorf school and also high school, the handwork teacher stopped teaching, which I assumed was so she could pursue other interests, larger art projects. Only recently did I learn that she has early-onset Alzheimer’s and can no longer sew the simplest stitch. Each year, three felted stars hold a small portion of the teacher’s life story as they hang on our tree. “I’m so impressed with the other Buddhists who don’t do Christmas,” a friend told me over the phone in mid-December. I had called her looking for someone in New England to pick Hugo up at an airport and drive him to what we consider our home sangha (basically Buddhist for congregation), Karmê Chöling in Vermont. Hugo, who several times has been a counselor for family camps and teen retreats, was asked to be an assistant teacher for Children’s Week. I don’t know if Children’s Week is a tradition that came from Tibet or, more likely, a creation of North American Buddhists to compensate for the hoopla of the dominate religion’s big day, Christmas. The notion of driving to Vermont in the dead of winter with a car full of children effectively dissuades me each year from participating and learning more. Most Buddhists I’ve discussed the subject with and who were raised in Christian families (quite a few are Jewish) still celebrate Christmas. While we may not emphasize the birth of Jesus Christ, there is nothing about the holiday that is incongruous with Buddhist beliefs. Peace on earth, goodwill toward all is the essence of both traditions and well worth consideration all year long. Still, there were many years when I felt the same way as my friend and openly asked why we went through all the trouble for this holiday when we aren’t even Christian? Partially, for many years I resented being the only one who set up and put away all the decorations (This is no longer a problem now that I live with Mr. Christmas, aka, Max.) And then, too, when the big boys became older, they weren’t as interested in trimming the tree, stringing popcorn and cranberries; they just wanted the gifts. Christmas magic dissipated right along with their belief in Santa. With Leif and Lyra, however, the magic has returned for all of us. The big boys are as eager to watch Leif come down the stairs and find a train running on tracks around the Christmas tree as are either of his parents. The flip side of the season’s message of peace is the consumer culture running amuck for several weeks. I took a job as part-time seasonal help at World Market this year, which has left me wondering why I require everyone at home to put every little scrap of paper in recycling, even down to empty stevia packets, when my store, like every store in the nation, is relatively vomiting tons of trash into the landfill each year and distributing a steady stream of plastic bags, which eventually find their way to trash islands in the oceans, killing untold numbers of wildlife. This is to say nothing of all the actual purchases that themselves quickly cycle into the trash only to have manufactuers ramp up for more merchandise to be given and disposed of again next year. And yet here I was working in order to raise the money to buy what my big guys really wanted—new clothing. While I rarely buy anything that isn’t deeply discounted, buying adult-sized clothes for two young men adds up. Claude wanted dressier clothes to wear when he attends symphony orchestra performances with a lovely cellist he has been spending time with lately. A whole lot of time. Hugo wanted dress shirts, ties and fine-gauged sweaters to wear over the dress shirts, something his choirs often require him to wear to school (and which he loves wearing). I would love to say I bought all handmade clothes, or at least clothes made in the US, but I didn’t. I bought clothes from the Gap and, thus, am a part of the cycle of consumption that relies upon cheap overseas labor. My only defense is that we wear our clothes until they fall apart, don’t think of garments as disposable and happily thrift for high quality garments. Claude’s favorite item is a cashmere sweater from Nordstrom’s that he found in his dorm’s giveaway box at the end of the school year last summer, which reminds me of my favorite sweater, a Ralph Lauren cashmere, that I took from the giveaway box at Karmê Chöling one summer. As a family we are pretty European in comfortably wearing the same outfit for days in a row, and these two high quality sweaters (that we do indeed wear for days in a row, Claude’s being a bold diamond pattern as seen in the Whoopsie Piggle Facebook timeline photo) underscore the notion that fewer but better clothing purchase is worth pursuing. But as of this Christmas, we bought new items from the Gap and Apple (work-related equipment for me), and other companies whose business practices are questionable. When I figure out a better way, I’ll be sure to spread the word. Jules wanted only one thing—a camera he could use to take pictures of birds. For several thousand dollars, you can easily pick up a good birding camera. 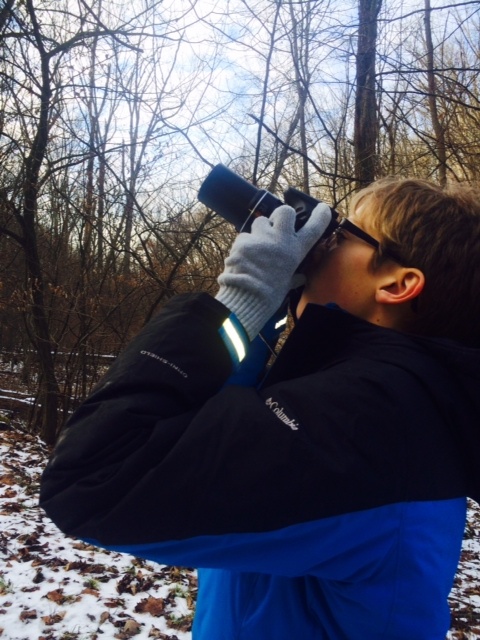 We’d been researching affordable options for over six months, with no real success, when at last November’s Ohio Young Birders’ Conference, Jules and I listened to a young man’s presentation on photographing a wide array of birds that visit his backyard. His very large Powerpoint slides had fantastic resolution and at the first opportunity, I found the young presenter and asked him about his camera. “A Canon SX 40,” he told me. It retails for less than $350, which is still a chunk of change, but Jules is happy to have it double as a birthday and Christmas gift from Max and me. Then there are the little kiddos. Max grabbed the big-ticket item that Leif had been asking for–his own kitchen. We “ate” many wooden pizzas that Leif served us all through the holidays, but Leif has been most pleased by the sizable train set we purchased for $10 last summer at a yard sale. The green engine, whom Leif has named “Thomas” and is as big as a teddy bear, considers Leif’s bed his engine house as that’s where Leif takes him each night. I engaged in toy lust when I found on a discount website a line of toys I thought no longer existed. The only plastic toys I ever sought out, Ambi toys were very expensive German import items when the big boys were little. When I thought Jules would be my last baby, I hung on to our three Ambi toys, placing them in a box for visiting babies to play with. 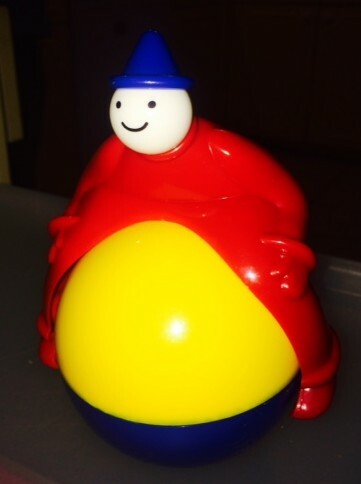 After Leif was born, I could not find Ambi toys anywhere in stores or online. Shop owners told me they believed the company had folded. Then one morning early in December, I saw an ad for Ambi Toys by Schylling on Zulily.com. Much less expensive than in the past (and I don’t doubt for the same dubious reasons our clothes are so cheap), I purchased a clown on a ball that I had coveted but been unable to afford nearly twenty years ago. “Look at him go!” says Hugo as he rolls the clown on the kitchen floor in my direction, “he’s so cool!” Lyra, however, is not interest in Rolly Clown other than to drop him, like all else, from the heights of her high chair tray. Letting go of the farce that I bought Rolly for Lyra, I may just take him to my office where he can help me write. Max and I are easy. I want the same thing every Christmas: Smartwool socks (made all over the world, including China, but also in the US and Canada). Seriously, I want and need for nothing other than a new set of socks each year and Max happily obliges. I gave him new slippers. I knew we’d feel surfeited, because we are. My boys and I have lived on very little, but even then we knew ourselves to be lucky. We live in a country with a big safety net, one we gratefully tapped into when we were in need. We’ve never gone hungry, cold or without medical care. Whenever there has been something one of the boys wanted that seemed out of our price range, we’ve always found a way. 2013 felt easier. Based upon his successes as a freshman, Claude was awarded substantially more money for school this year. His freshman year, Claude and I spent every penny we made on his tuition and materials, including a required computer. For nine months, neither of us had any extra money. I bought nothing, which didn’t feel so bad to be honest. Which means that without a tuition bill and a little extra money from World Market, I felt flush. It doesn’t take much. After lunch on Christmas Day, I called everyone back into the living room and asked them to listen to an interview with Peter Singer, a Princeton professor of ethics. Singer’s passionate belief is that you get more bang for your charity buck by giving to vetted organizations working outside the US in deeply impoverished countries. His organization, The Life You Can Save, currently endorses only ten charities–ones shown to affect real change and not waste money on overhead and administration. I’d love to tell you that the boys sat listening with rapt attention and then got online and filled out the forms to give a few dollars each month to one of the ten charities. Instead, I had to keep asking them if they were awake. With onion tart in their bellies, all three big boys stretched out on the living room carpet and closed their eyes. I told them that beyond my current giving to NPR and Karmê Chöling (about a dollar a day to each), I planned to start giving $50 a month to Oxfam. I can’t make the boys be philanthropic; forced giving isn’t really giving. Besides, I long ago put Claude and Hugo in charge of their own finances. But I can plant the seed by modeling the behavior I hope to see. Fifty more dollars a month is a lot from my budget, and nearly doubling the amount I give to charities each month. 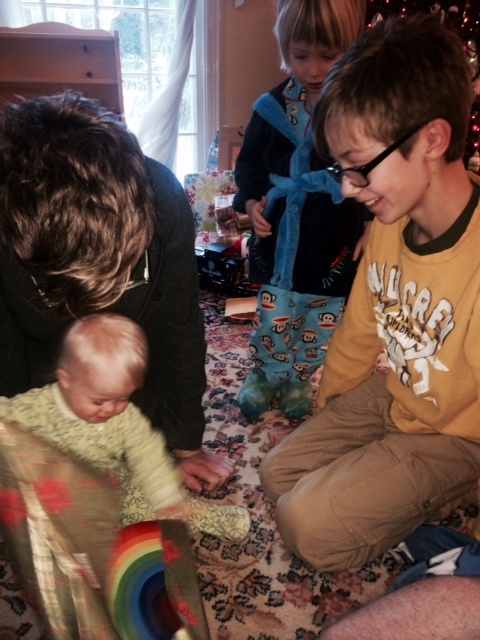 And, in full disclosure, this is not the first time I’ve discussed charitable giving with them at Christmas. I tell them, I model it and then I let it go. They’ll figure it out. I miss the annual notes from acquaintances such as my former physician and his wife who, during the years of George W. Bush’s administration when Democrats everywhere were depressed, would write and tell me that at least they could pretend they lived in a different world each week when watching “The West Wing.” Or receiving photocopies of pictures taken of my home and its residents from more than a century ago through the 1990s. They were sent to me one Christmas by the children of the very elderly man who sold me the house, which he’d inherited in the 1940s from his uncle who had had it built in 1909. And, yes, I miss the feeling of accomplishment when, after putting together my little holiday projects, sealing and stamping each envelope, I’d take them all to the post office, pull open the metal drawer on the wall inside, place the cards in stacks and listen to them satisfyingly drop into a bin on the other side of the wall. But I’m not going back. I’m moving ahead to the next essay and the next, and so on. Happy New Year. Be kind to yourselves and one another. This entry was posted in Uncategorized and tagged Ambi toys, Buddhist Christmas, Children's Week, Christmas cards, holiday traditions, Karme Choling Buddhist Meditation Center, Overdressed: The Shockingly High Cost of Cheap Fashion, Peter Singer, Pope Francis' appeal to non-Catholics, rampant consumerism, season of peace, storyofstuff.org, Teaching charitable giving to one's children, The Life You Can Save. Bookmark the permalink.